The shedding of whose blood pleased God the Word. 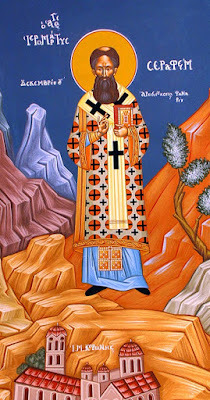 St. Seraphim hailed from Pezoula (Mpezila), in the Agrapha region of Greece. His parents, Sopronios and Maria, raised him on the spring waters of the Faith from his earliest childhood days. Accordingly, they enrolled him in the [local] “school of sacred letters.” The young Seraphim, even when he was not attending school but staying at his paternal home, spent the greater part of his time in the reading of Scriptures and the lives of the Saints, at the same time never being absent from Divine Services. 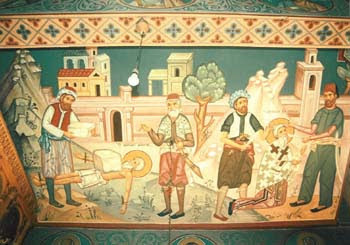 When he got older, he ceased showing interest in any of the matters of daily life and, seeking a place to pursue the ascetic life of hesychasm, ended up in the Holy Monastery of the Most Holy Theotokos, or the Holy Monastery of the Cold Spring (subsequently called the Monastery at the Crown or Koroni), where he remained and was tonsured a monk, eagerly imitating the most virtuous of his brothers. Over time, his fellow monastics, having seen all of his own virtues (fasting, watchfulness, humility, and love), proposed that the Saint, who accepted, be ordained, initially as a Reader, thereafter a Deacon, and finally as a Presbyter (Hieromonk). 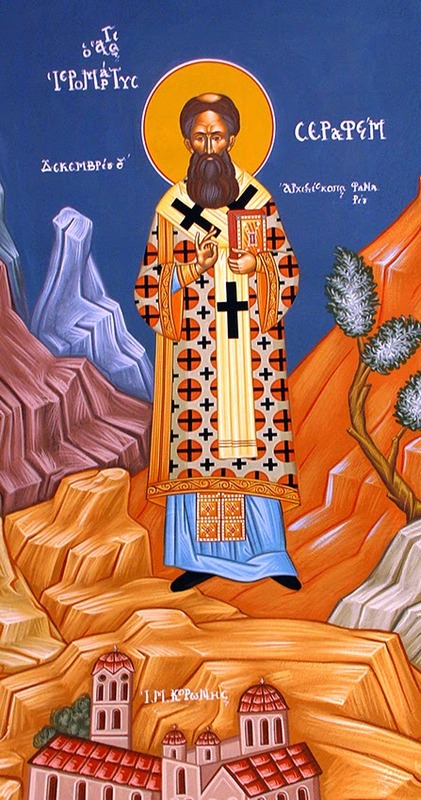 Such was the esteem in which the faithful and the monastics held his person, that after the passing of the Metropolitan of Phanarion and Neochorion, Seraphim was elected as the new Bishop. The Saint, assuming the care and guidance of so many souls, redoubled his struggles, caring for his flock and, indeed, frequently calling himself a lowly servant, all the while ardently keen to be found worthy of the crown of martyrdom, something that was not long in coming to fruition. During this period, at the beginning of the seventeenth century, the Metropolitan of Larissa, Dionysios the Philosopher, was preaching revolution [against the Ottoman Empire] in the regions of Epirus and Thessaly, which met with no success, while the Metropolitan, as the one accountable, was in the end tortured to death by the Ottomans. Coincidentally with this activity, Seraphim travelled to Phanarion, Karditsa in order to give the designated periodic tributes to the Aghas. The Ottomans, believing that Seraphim was also participating in the incitement of revolution, attacked him, at first verbally, suggesting in particular that he renounce his faith, so as to escape punishment and to eliminate their suspicions. After the refusal of the Saint, the Turkish mob carried him off to Hamouz bey, who was the Pasha of Phanarion. Thereupon the Agha commanded that he be beaten mercilessly and that his nose be cut off. While the Saint was enduring all of this, he continually gave thanks to God that he had been deemed worthy to be martyred for His name. Afterwards, Seraphim was imprisoned for a day without food and water. In jail, he rejoiced and praised God, thanking Him for the sufferings that he was found worthy to withstand, to the glory of God, asking God for the strength to bear his approaching martyrdom. The next day, the Ottoman ruler ordered that Seraphim be brought to him again. Hamouz, employing new threats, tried to change the Saint’s mind. But St. Seraphim restated ever more definitively his decision not to deny Jesus Christ. So, the Agha ordered that he be beaten more viciously. The torturers continued their inhuman efforts, stretching his hands and feet with ropes, simultaneously placing a large stone on his abdomen, and cutting him continually with knives. Then they gave him water with dirt and bile to drink, yet the face of the Saint was radiant, as though he were taking part in some banquet instead of being tortured. Even his torturers looked on the Saint with admiration. 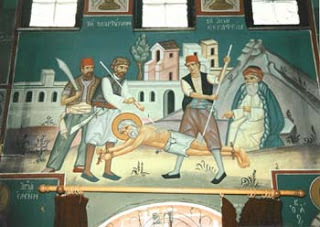 Near a cypress tree in the vicinity of the market place in Phanarion, the Saint gave up his spirit, mortally wounded in his entrails. (He endured martyrdom by impalement; i.e., they skewered his body with a stake). This was on December 4, 1601. The holy body remained there for some days, affixed to the stake with which he was tortured, but his body did not decompose. On the contrary, it looked like a live body and emitted an ineffable fragrance, producing wonderment and contrition among the faithful and consternation among the Ottomans. 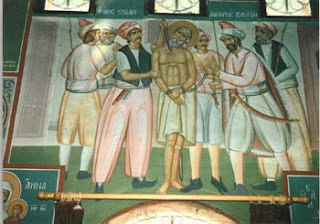 The Pasha refused the request of the Christians that his body be released to them. After a number of days, he ordered that the head of the Saint be cut off and sent to Trikala, along with other heads of revolutionary fighters aligned with Metropolitan Dionysios and common criminals, as well. There, all of the heads were placed on poles, creating a macabre forest, in order to set an example for those of other religions (non-Muslims) in the area. 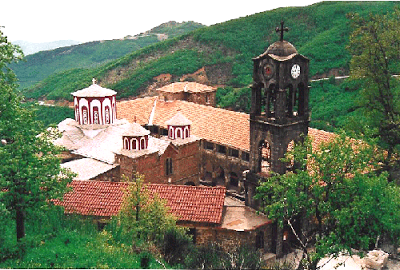 The Abbot of the Holy Monastery of Dousiko,12 located near Trikala, gave a certain Albanian Christian fifty silver coins to steal the head from the place where it was under guard, with the goal of keeping it as a treasure in his monastery. The attempted seizure of the Relic was detected by the guards, who angrily pursued the Christian, who in turn quickly ran away with the Relic. Nearing a bridge on the River Peneios (Peneus), he saw that his pursuers were dangerously close to him. So he threw the holy Relic into the river and ed with haste from the Turks, who had stopped and were observing the foregoing scene. A short distance from the bridge, two fishermen, who had built a small dam in the bed of the Peneios, miraculously found the holy Relic and, because they knew him, reverently delivered it to the aforementioned Abbot. Shortly thereafter, the Abbot of the Holy Monastery at the Crown asked for the Relic from the monks at Dousiko, since St. Seraphim had been a monk at their monastery, remunerating them the fifty silver coins that had been paid to the Christian who was sent to steal them. From that time on, the skull of the Saint has been kept there as a treasure, and to this day it is fragrant and frees all of those who seek the intercession of the Saint from every disease and adverse thing. 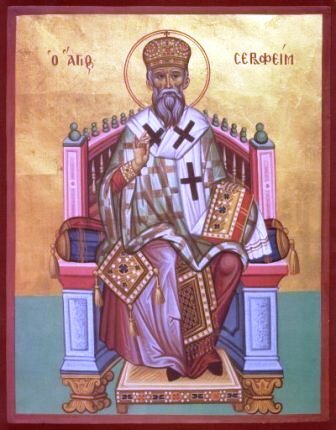 The offspring of Agrapha, the leader of Phanarion, and the boast of Koroni Monastery, Seraphim let us honor for he struggled radiantly for Christ, and he freely pours forth miracles and delivers from corrupting diseases, those who cry out in faith: Glory to Him Who gave you strength, Glory to Him Who made you wondrous, Glory to Him Who grants through you, healings for all. The adornment of Agrapha and the lamp of Phanarion, the support of the faithful, boast of Hierarchs, be swift now to beseech for us, O champion. Destroy the wiliness of avenging spirits, that we may gladly honor your athletic contest, praiseworthy Seraphim. You were perfected with holy anointing, fervently undergoing, the martyrdom of Christ; you were not put to shame with your pure struggle, O Seraphim, for Christ has glorified you.